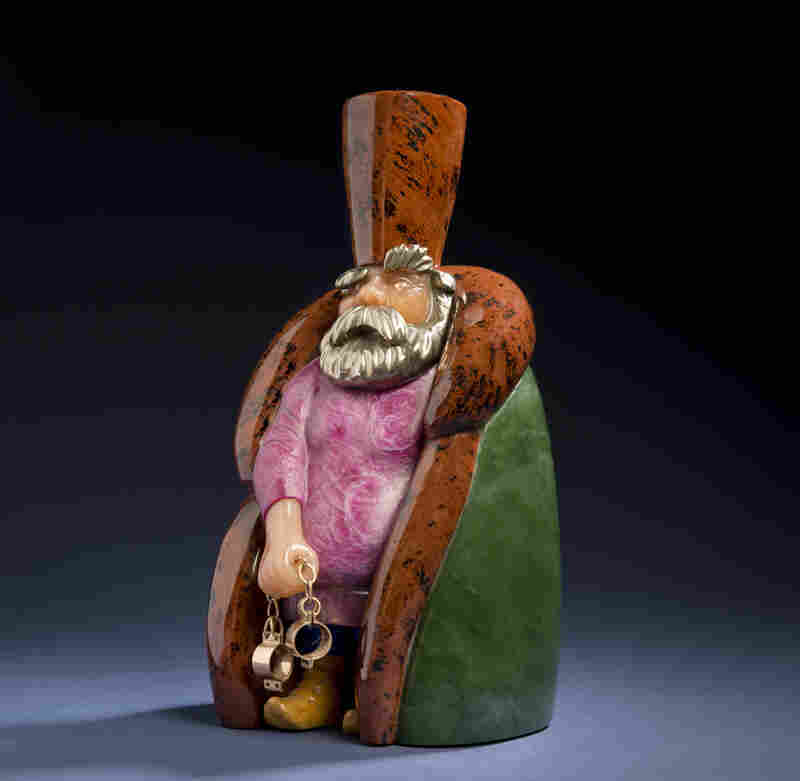 Emigre Artist Sculpted Exquisite Gems Of Russian Folk Life Semiprecious stones were the medium of choice for Vasily Konovalenko, a Soviet ballet set designer turned sculptor. His masterful workmanship captured Russian characters, from Cossacks and drunks to country folk and czarist henchmen. He fell afoul of the authorities and left Russia for the U.S. in the 1980s. Bosom Pals, an iconic sculpture by Vasily Konovalenko, was created between 1981 and 1984. It shows three revelers out for a night of drinking and song. Konovalenko loved this scene so much that he repeated it in other works — including enamels and bronzes and in sketches. Cossack, completed in 1979, is another classic image, which reflects Konovalenko's Ukrainian heritage. It was completed in 1979. 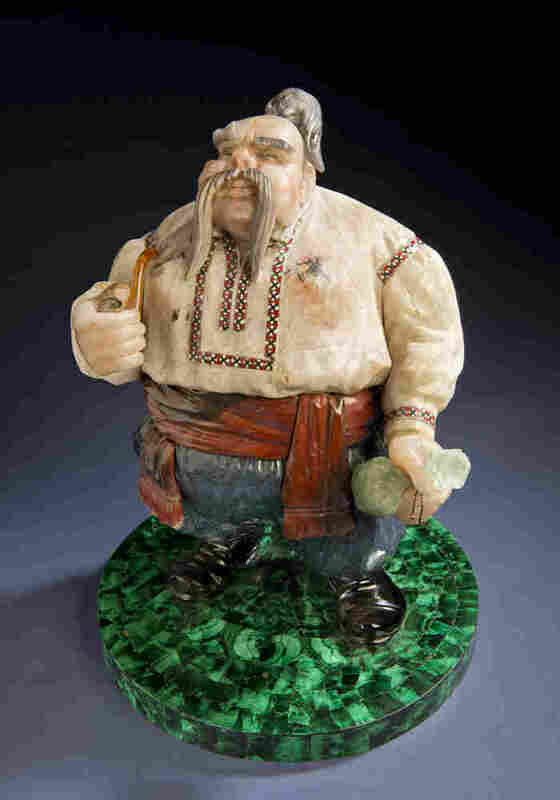 The base of the sculpture is nephrite; the Cossack's shirt is cacholong, a form of opal, and includes enamel inlay. It measures about 11 inches tall. Danila is the sculpture that marks Konovalenko's entry into gem carving. 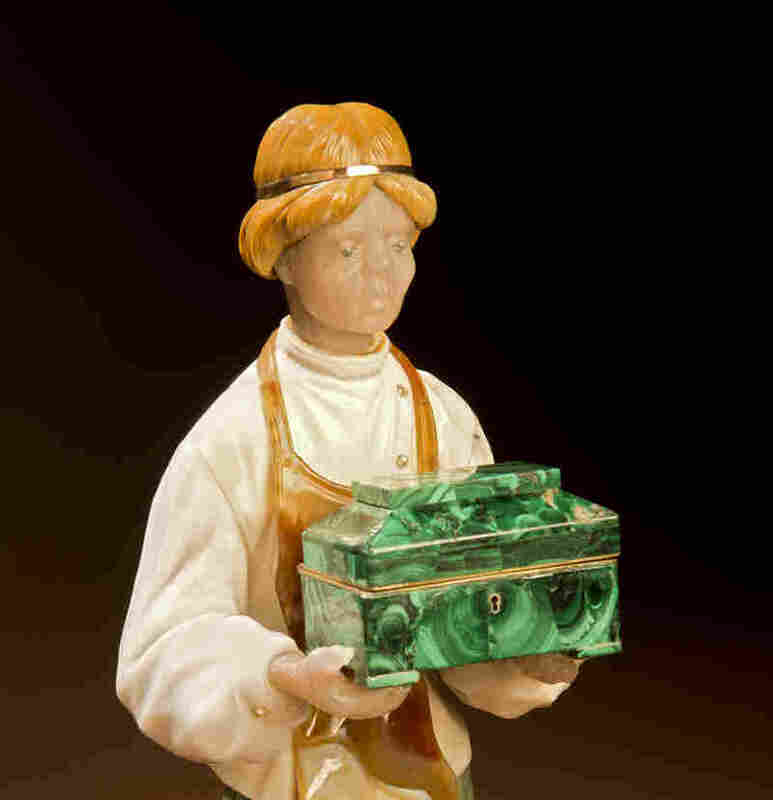 Konovalenko was working at the Maryiinsky Theatre in St. Petersburg when he had to make a malachite box for the stonecutter Danila, the protagonist in the ballet Stone Flower. 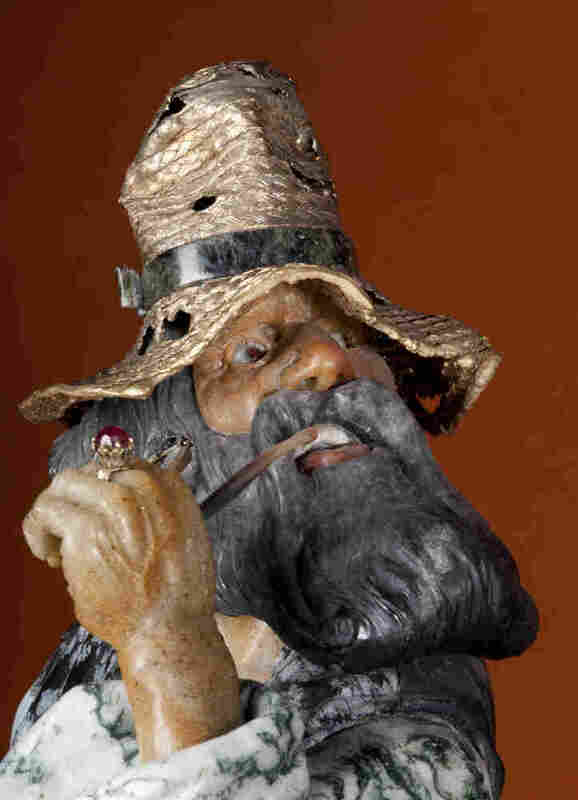 Gold Prospectors is the only sculpture with an American theme; it was completed during the 1981-1984 period. 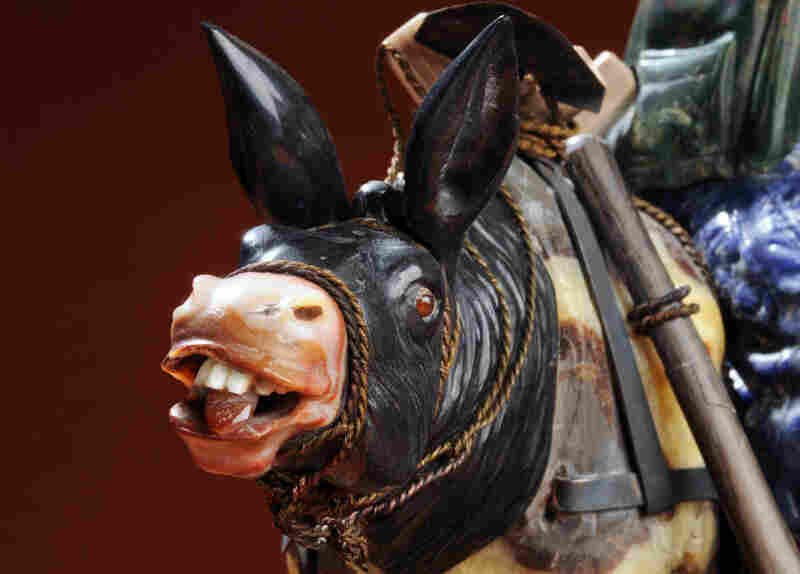 Here is a detail of the donkey's expressive face, braying his displeasure at the folly of his mining owners. A close-up of the man in Gypsies, one of the last sculptures Konovalenko made, shows the artist's extraordinary level of detail. The veins and the tendons are visible on the man's hand. His hat is gold-plated silver; his eyes and ring are ruby; his face is Beloretsk quartz. Prisoners was finished between the 1981 and 1984 period. Konovalenko manipulated banded obsidian to create the correct angles for the man's uniform. The sculptor also took advantage of the natural flaws in the Beloretsk quartz he used for the face; the man appears jaundiced, frostbitten and severely unhappy, as one might expect. 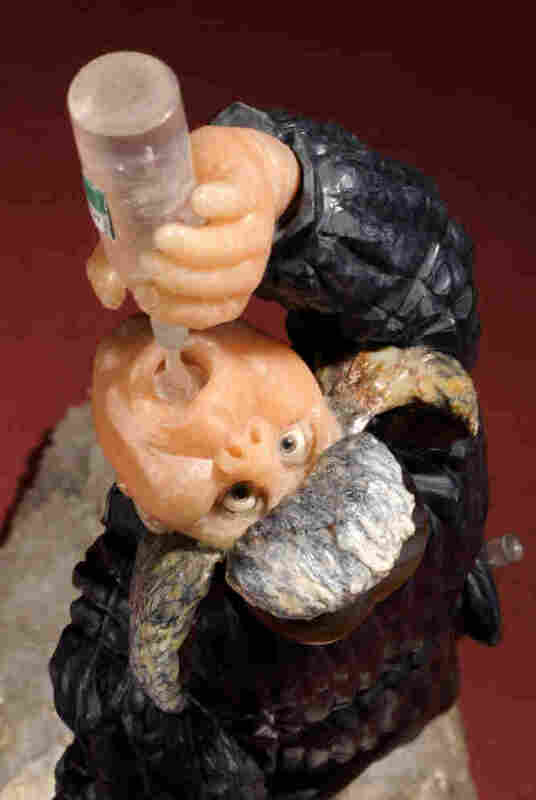 Toper, or Drinker, photographed from above, is a prime example of how Konovalenko designed his sculptures to be theatrical and seen from all sides. Note the vodka pooled up in his mouth, the detail of his hands, and the fact that his eyes are ever so slightly crossed, as anyone who has ever chugged vodka will attest is a natural reaction. Czar's Henchman depicts Ivan the Terrible's security guard and torturer. His shirt is ruby; the green portion of his coat malachite; the trim of his coat and his hat are a brown obsidian. His left eye is diamond, for the henchman sees all and misses nothing. Warrior is a classic Russian piece created in 1961. 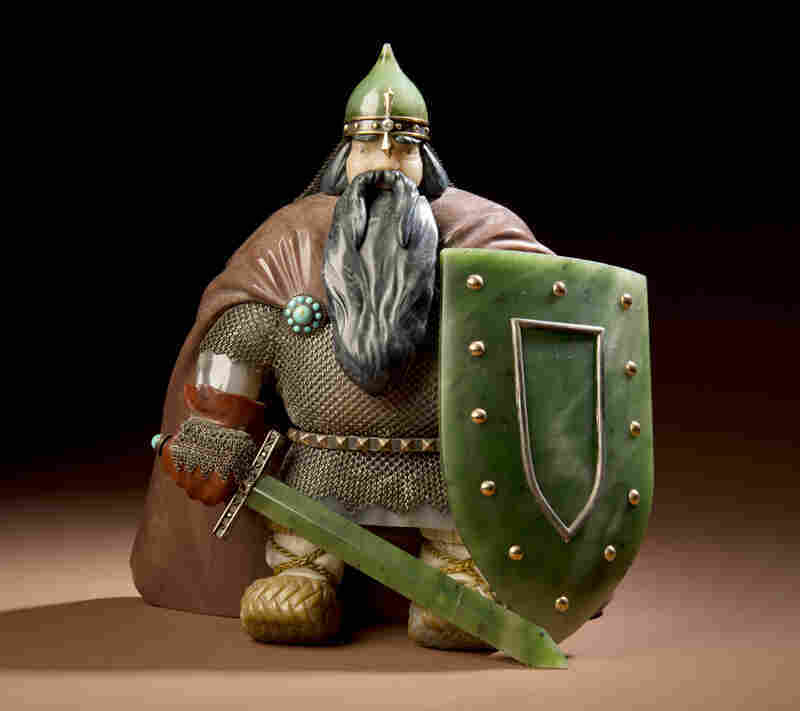 His shield and sword are nephrite, which Konovalenko loved to carve, for it had "special qualities like no other stone." A team of American researchers is on a treasure hunt for jewels — of both artistic and historic value. This month, researchers from Denver were in Russia to document the work of Vasily Konovalenko, a former ballet set designer turned sculptor, who created scenes from Russian folk life in semiprecious stones. In the 1980s, Konovalenko emigrated from what was then the Soviet Union in search of artistic freedom. Now, his legacy is divided between the U.S. and Russia. Stephen Nash, a curator from the Denver Museum of Nature and Science, recently visited the Moscow Gem Museum to see the work that got Konovalenko in trouble with Soviet authorities. Nash's enthusiasm bubbles up as he describes a piece called Sultry Mid-day. It's roughly 15 inches long, set on a platter carved from malachite stone, as green as moss. Gray-blue agate has been set into the malachite. "Into those agate circles, which look like pools of water, are two middle-aged women who are enjoying cooling off in the summertime with tea that's being cooked in a samovar," he says about the work. 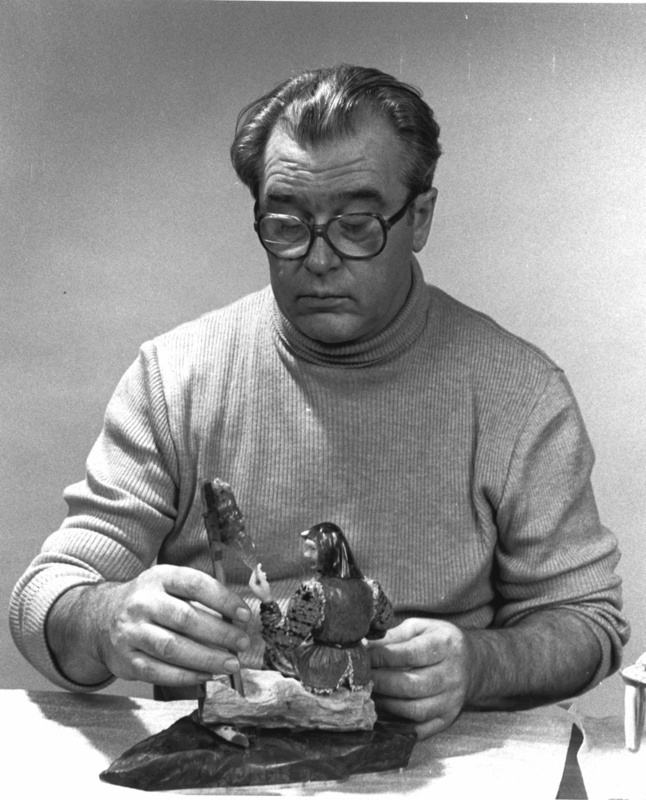 Set designer turned sculptor Vasily Konovalenko (ca. 1984) is seen with a work titled Grandmother. The ample bodies of the women are carved from a ruddy colored quartz; the samovar is of clear crystal. "And they're sitting across from each other, there's a table between them, floating on the water," Nash continues. "It's made of petrified wood so that it looks like a wooden table." The Konovalenko sculptures aren't studded with gems, like a Faberge egg — they are gems, big chunks of semiprecious stone. In the 1950s, Konovalenko was a young set designer at St. Petersburg's Mariinsky ballet theater. He discovered gem carving when he had to make a malachite box as a prop for a ballet called The Stone Flower. According to his widow, Anna, he fell in love with the art and began to use it in daring ways. Konovalenko had his first big public exhibition in 1973, and people loved it, she says, except for a certain Communist Party official. "The main person of Communist Party of St. Petersburg ... became angry not to be invited to opening of exhibit, and he started to try to put my husband in jail," she says. Among other things, she says, her husband was accused of making fun of the Soviet people. Konovalenko was eventually forced to give his entire collection to the State Geological Museum and to take a job creating sculptures that were often given as gifts to visiting dignitaries. In 1981, the Konovalenkos got a chance to immigrate to the United States, and they took it. From then until his death in 1989, Konovalenko produced dozens of works, some 20 of which are now in the Denver Museum of Nature and Science. 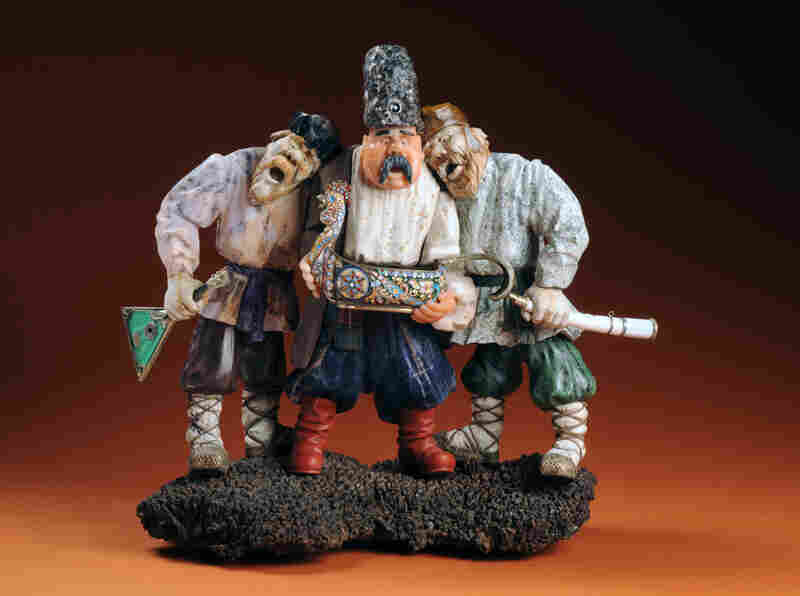 For all their masterful workmanship and exquisite materials, the pieces are broad and bold, essentially caricatures of Russian types: Cossacks, drinkers, warriors and country folk — even a czar's henchman, who might have been a forerunner of the feared KGB. 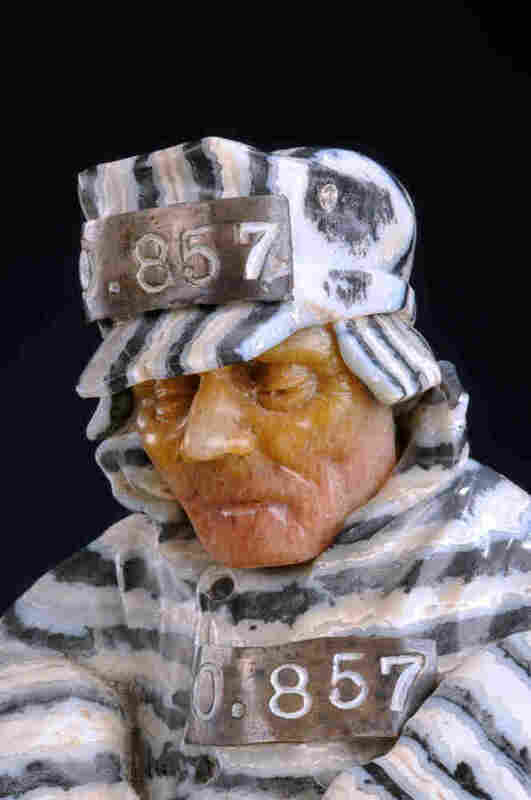 Anna Konovalenko scoffs at the charge that the sculptor was making fun of his subjects. "He was very interesting, very artistic person — like actor ... because everything [he did] he had in mind a certain person who [he] met during his lifetime," she says. Nash, the Denver curator, says he thinks the result rises above folk art or caricature. "I see it as fine art. There's no other way to interpret it. The genius of Konovalenko's gem carving is evident in each and every piece he created," he says. Nash thinks Konovalenko's background in the theater contributed to the dynamic, theatrical quality of his pieces. Nash and photographer Rick Wicker hope to document as many of the sculptures as possible in the United States and Russia for a book on Konovalenko's work.